Antiques challenge. Experts James Braxton and Catherine Southon face off for the big showdown - who will be the overall winner? Browse content similar to James Braxton v Catherine Southon - Showdown. Check below for episodes and series from the same categories and more! the insider's view of the trade! the moment our dealers have been waiting for. the First Lady of Fine Arts Catherine Southon. but that counts for nothing, because this is the mighty Showdown! Catherine is outwitted at the car-boot. James gets carried away whilst bidding. That could present a problem for me. And emotions run high at the auction. as antiques experts of the highest calibre. the Put Your Money sheriff badge of honour. Riding in from the West, it's the Sussex Saleroom Supernova. and impeccable manners to match. I've seen quite a few candidates. Look a little further round and I'll hone in on them. His opposition today is a true dealing diamond. and her haggling skills are second to none. It's Kent's Queen of Quality, "Canny" Catherine Southon. An avenue full of bargains. and any profit they make will go to charities of their choosing. But there is of course a tricky twist! where they'll be at the mercy of the bidding public. It could be where they win big...or lose it all! and think only of profits. Welcome to the mighty Showdown. Are you ready for this? Oh, yes, I'm ready. Read away. "in direct competition with your opponent." "The winner is the expert who makes the most profit." Good luck. Mm-hmm. As you ready for this? and ready for their gargantuan challenge. and they're at Tamlyns in Bridgewater, in Somerset. and Catherine has already found something worth writing home about. There's a real assortment of postcards here. Anything from lifeboats to Barbados. there is a gem to be had. but he's got a different tactic. If it's cheap, I'll go for it! as the sale is underway! First up, those postcards. Five, I have. At five pounds. Do I see eight anywhere? No. On my left at £18. Catherine pays £21.89 for the postcards. on a rather unusual pigeon racing clock. At 40. Standing at the very back at £40. You all done now? So the pigeon clock flies home with James for £48.64 with fees. But it seems ornithology isn't his strongest subject. was a pigeon breast salad. But this is not for eating. This is for racing. Nicely boxed. Here is the clock itself. In here. Don't know how it works. I'm going to put it back. I've got the case. I think I'm on a winner! Catherine's won herself a nautical watercolour for £42.56 with fees. This could make me a very happy girl. It's signed and it is dated. It's an Australian artist - Alcott - dated 1920. But I think I can easily sell it for £100 to £150. There's no way that I will be on a sinking ship. So that's our canny collector's two lots in the bag. more lot to buy, and he's spotted a collection of bread tins. I've got £18 on here. It's 18. Do I see 20? 38. 40. At £40. At the back there at 40. 42. 60. 65. 70. No, he's gone. At 70. On my right at 70. At £70 then. Are you all done at 70? Get a man on the rope. I marked those £14. That could present a problem for me! and he ends up paying over four times what he wanted to. Here we are, the most expensive bread tins in Somerset. There are three particular sorts. We've got Reynolds. We've got the Hovis tins. I think farmhouse refers to the type of loaf that was baked in it. And it's a big fella. I am a secret bread-maker. and hopefully I can wriggle myself out of this one! Bingo baking his way to success. Possibly. is done and dusted! Time for a quick look at the books. so has over just over 866 left to play with. more than £935 for the rest of the game. Without further ado, it's onto Round Two. in the pursuit of their next potential profit. And is appears James is feeling pretty chipper about the challenge. There's lots of choice on these streets. The pound is strong and the euro is in my favour. So almost a 20% discount. There's nothing our dealers love more than a discount! when she spots a games compendium. That's nice. How much is this one? Can I give you 100 for this? Oh, go on! As I am your favourite. -110 and we are done. Go on. and it's her priciest purchase yet. But she thinks she's got a bargain! Delighted with my Showdown purchase. This games compendium is going to win me lots of big prizes here. This is going straight off to auction as it is. Not doing anything with it. And I think it's going to turn a very good profit. And, after all, the winner takes it all! Canny Catherine has her sights set firmly on victory! And she wastes no time swooping in on her second purchase. I thought maybe one of those tripod ones. Then I saw this which is rather nice. I'm hoping this will probably be around £50 to £60. Then I will snap it up. How much for your easel? -What's the very best you can do on that? 55. OK. I'll take that from you! and Catherine's two items are in the bag. and he's just bagged himself a polo painting for just under £29. And he thinks it'll do well at auction. I am thrilled with this. Polo players. The auction's in Cirencester. This has got Cirencester written all over it. There will be buyers for this. I think I'm in the money! Always thinking of the bigger picture is our Bingo! bronze leaf applique for a pricey £122.95. It is a heavy fellow, this. It's bronze. It's French. And it's by a J Rabillon. This is quite a risky piece. I've got the Showdown Auction. But really, at auction, this has got to make £150 plus. That's the biggest purchase so far from Bingo the Brave! And that brings us to the halfway point in our buying bonanza. Both our treasure hunters started out with £1,000 of their own money. so he's got over £714 left. Round Three is the car-boot sale. wait to get stuck in. I have only spent a few hundred pounds of the Showdown money. I know this place has great potential. I've just got to find it! I can't pay you anywhere near what you're wanting though. -That's all right, then you can't have it! Oh. Well, what...do you want to negotiate a little bit? All right, I would accept £80. -I think I'm mad, actually, aren't I? -No, I think you're mean. But I will take 75 off you. And I shouldn't do. -This hand says 70, this hand says 75. -So there is a fiver in it. -Did you see that? That was robbery! Yes, that was a canny move worthy of you, Catherine. But luckily, she's still happy with her purchase. This is a super cool 1950s hairdryer! I can imagine this, once upon a time, in a rather smart salon in France. and the original maker's badge there. that all the electrics are working fine before I sell it. I'm very happy with £75 because I think really it's worth about 300. Bingo's just bought himself a pair of gates for £50. I like the fact that they are different sizes. They are the same design but they are different sizes. This is to get the wheelbarrow through. This is to allow the lady of the house to go through. Ah, Lord Braxton, always thinking of the ladies. heading towards the dealer that sold her the hairdryer. Watch out for his handshake, old boy! What is this strange spiky thing I see there? In France, they call it la herisson. La herisson. Why la herisson? What does la herisson mean? -Ah, the hedgehog. Mini spikes. -My normal price for this is approaching £100. -God, I wasn't expecting that! -It's possible I could negotiate. I was going to... I thought it was going to be around 50, to be honest. -Go on, then, 70 quid. -70. Put your hand there. -I've got terrible tennis elbow. -Oh! Oh! Be gentle with me. Ah, the handshake trick again. We did warn you. And his bottle drier means Bingo's all bought up. A few stalls away, Catherine has honed in on her second buy. I've spied this in a cabinet. I think it's a pretty smart item. We've got a page turner in the form of an owl. And it is really nicely modelled. Beautifully carved throughout, with the feathers on the back there. Lovely glass eyes. It's got lots of black splodges on it. Ink splodges. probably late 19th century and it gives us that real age. It's a little bit broken at the end there. But I'm not really bothered about that. The lady is asking £50 for it. If I can get it at around £30, it'll be a very wise purchase. I see you are asking 50. I would love to offer you 30. Would you be happy with 30? because I've got to try and sell it on and make a bit of profit on it. -OK, I'm happy with that! 35. -We'll give that a go. £35. Round Three and the car-boot comes to an end. Before we move onto the final round, let's take a look at the figures. so still has a sizeable £594 left to spend. meaning she has a whopping £686 to take through to Round Four. steeplechase is the antiques fair. Bingo, it's the final round. our experts throw themselves into the fray. And Catherine soon spots a pair of stools. They've got, I mean, they are almost quite Arts and Crafts-y. They have got an Arts and Crafts-y bit, haven't they? -I'll give you 20 quid for them. I've got 46 quid on them. 25 quid. That's the death. -OK, yes, I'll have those. She's a hard haggler, and seals the deal at nearly half price! Bingo's spotted a painting that's sparked his interest. This picture is...just has a little twinkle about it! but it just has an attraction to me. Totally consistent with its date. 71. Price-wise, I don't know. £40? -50? I'll give you 50. Our daring dealers both have just one item left to buy. and the whole Showdown could rest on this final deal. bagging herself a set of cased bottles for £50. is that these bottles are faceted and they're in really good condition. Each top is monogrammed and the monogram matches the lid. All in all, a pretty nice set for £50. I think they're going to tootle off to auction. So that's Canny Catherine spent up. pounce on an early-20th-century enamel-topped glass inkwell. -It's got to be 50, has it? -Yeah, you can have it for 40 quid. It's the end of the day. It's cheap, really. -I'll buy that for 40! That's kind. Thanks a lot. Really kind. Yes, he's done it! With that deal in the bag, our buying bonanza is over. Eight epic deals done across four fantastic locations. let's take a look at the final figures. They both started with £1,000 of their own money. James spent just under half his budget, at £495.40. parting with just £388.79 in total. strategies, a chance to compare notes. HE GROANS Oh, the Showdown has been hard! What are your principal sparkling objects? I didn't buy any sparkling objects, really, in the end. Oh, rubbish, you did! That games compendium is lovely. -Oh, yeah, no. I love that! -That was a great buy. Fabulous buy. market in Belgium. And I think, strangely, perhaps the boot fair. I bought that sort of polo playing picture, didn't I? Cirencester, one of the great homes of the mighty game. -It's all in the selling now. Now, there's a mighty long journey ahead. from their purchases in a quest to bank the most profit. and really earn their selling stripes. the terrifying Showdown Auction is also looming large. the Don of the Deals, Bingo, feels variety is the spice of life. What a miscellaneous bunch of items I've got here. that I'm going to sell privately to a very nice garden. Here, on my left, the hedgehog - la herisson. It's a bottle drier. A French bottle drier. in the trendy parts of towns all over the place. They want them. It's rather like introducing a hazard to the home. that has already done good service here. a little more about it. Interestingly, the nation has gone baking mad. I think they are sort of bang on-trend at the moment. And then, lurking in front of those gates, that is the applique. Very heavy item. It's bronze. It's a big old swag. I think that might do quite well. I think I might put that forward to auction. It's large. It's decorative. But I've delegated all that part to the auctioneer. It's up to him, really, whether I make a profit or a loss. and glass enamel inkwell into the auction. Over in Kent, Catherine is pondering her purchases too. I think I can safely say that I'm pretty happy with this selection. Starting off with the owl here. This is a paper knife and I think that it is really beautifully carved. So I think it's a novelty piece that should do rather well at auction. My favourite piece of the whole Showdown has to be this compendium. It's superb in every single way. This is another piece which is definitely going off to auction. Because I can see this making £150 to £200. gentleman's bottles. They've got everything going for them. And the case as well is in lovely condition. My artist's easel. It is a modern piece, but these things sell. They sell so well at auction. So that is something that I would like to earmark for auction. it was one of my last-minute purchases. to a pub or someone who collects maritime memorabilia. But this has to be the real piece of the show. I need to find somebody who's got the same vision as me. Someone that can see this as a light in a corner of a room. and I have no control over them now. They are in the lap of the gods. But I've still got to sell the rest. and that includes those postcards and fire stools. Bingo is kicking things off in Kent, where he's getting back to nature. and friend Edward, who has most glorious gardens. Hopefully, within the 16 acres, there'll be room to place my gates. will the gates open up to a profit? I bought this at a car-boot. The reason I bought it is, I quite like the asymmetry of it. try to keep the public out of the very house domain, as it were. Edward, I would dearly love to get £250 for them. I hope you might settle for 150 or something like that. And we'll call it a day. How about that? I tell you what, I tell you what, you are in the right area. I'll do you a special price. 190. -180 and we've got a deal. pocketing himself a £40 profit. Over in West Sussex, Catherine's on the hunt for her first buyer. to show interior designer Laura. Remember, it cost her £75. It's going to take a bit of work, but I do love it. I thought it was probably '60s and I love the fact that it's beehive-ish. -It ties in with the '60s. And the fact that it's got the original maker's plaque on it. I would say it's probably French from the wording. Now, this did have its wiring inside it. so I thought the safest thing to do was to strip it of its electrics. and converted into a light anyway, I think. In order to make any money at all, I would be looking at around 150. I was thinking more around the 100 mark. If we say 130, that would be good for me. -120. That's fine. We'll go for 120, that's fine. Er, hold on, did you just do yourself out of a fiver there? After paying for the electrical work, it brings her a £30 profit. But she missed out on a fiver. Someone tell her what happened! and that's what we shook on. Oh, well. It's only a little profit, but that's a huge weight off my mind. Well, that's one of her priciest purchases sold. -Absolutely! I should have said more. Adding another tenner to her profit pot. So Catherine has two sales under her belt. But what's Bingo up to? Well, he's taking a step back in time. the landscape behind me is not in fact Yorkshire, it's Dorset. Made famous by a bread advert. And there's no better place to sell my tins! Yes, Bingo's in Shaftesbury and heading to the Gold Hill Museum. Terry might want to buy his bread tins to donate to the collection. They cost over £85, so let's hope it's not an uphill struggle! Terry, you are the august what here? I'm the chairman of the committee that runs the museum. -Amazingly, we have about 20,000 visitors a year. Most visitors to Gold Hill come to look at the museum. Why do they come to Gold Hill? Well, I suppose they've all seen the Hovis advert of 40 years ago. It's still a very popular advert. -Here we have it. The branded item. -I've never seen one of those before. -I wonder where you got them from. I bought these at auction. There are 14 tins in all. I was rather hoping somewhere between ten and £15 per tin. I would have said eight. It's a bit fine for me. I think you've done this before, Terry. Put it there, Terry. It's a very good thing! So our star baker cooks up a tasty £34.88 profit on the tins. They've got the tins and I've made some dough. But he doesn't have quite the same luck with his pigeon racing clock. It turns out not to be as unique as he thought! But pigeon fancier Caroline agrees to take it off his hands for £40. I'll take it, although I've made a thumping great loss. I'm very happy to take that. So Bingo's profits are hit by £8.64. And with that, his selling is done till the Showdown Auction. In Berkshire, Canny Catherine is still on her selling spree. I've come to Hungerford to see Don with my lovely marine watercolour. I think it's going to be plain sailing all the way. Well, she's certainly feeling confident! The painting cost her over £42 to buy. -Don, how lovely to see you! -Hello, Catherine. Nice to see you. By John Alcott. Dated 1920. Do you want to go 165? -Yeah, I'd rather go 165. -165. What am I doing?! I'm taking the price down. I'm supposed to be pushing it up. Er, she's done it again! Talking herself out of a tenner! and adds a heft £122.44 to her profit pot. She then goes on to sell her postcards to a collector in Kent. But it turns out there was no hidden gem after all. She makes just a small profit of £3.11. So that's both our dealers' private sales done and dusted. pretty with the best cushion of cash? she's a little way behind, with £165.55 profit in the bank. leaving his rival on the hop. other side of the rostrum here in Cirencester. Hello, James. How are you doing? Always a kiss, not a shake of the hand. -Fine. How have you done so far? Well, it has been a bit of a mixed bag. What about you? because I've got quite an expensive item. -That is a meaty one, isn't it? -It is a meaty one. -You going to make a lot of money on that? but they're not exactly brimming with confidence, are they? Before the sale begins, they sneak a peek at each other's lots. Of all of James' items, this has to be my favourite! Polo players. Mixed media here. running through the field. The estimate on this is £50 to £80. James paid just under 30. I can see this winning the race. It's got to be £100. you open her up and reveal contents after contents. It's a really lovely item. I don't really think it's got a huge amount of age. And I do think it will struggle. But time will tell and stranger things have happened. The letter opener. It looks a bit fragile to me. It's lost some of its blade. Catherine bought it for £35. It's got ten to 20 estimate. In its favour, it's got a fabulous handle. Glass bead eyes. Owl - emblematic of wisdom. as the auction is about to get underway! and steel themselves for the Showdown. it cost her just over £94. Catherine, are you nervous about your first lot? I am, really. I'm a bit upset because the estimate seems very low to me. -What, for the games compendium? -There's lots of people here. -I'm sure it will do well. -This one...I'm very worried about. -Come on, give me some more hands! -At £60. Come on! Come on! -At £70 at the back here. £80. At £80 now. £80 here. -At £90. Selling in the room then. £90. Are you all done? It's a breeze now, James. and the box makes a £34.08 loss after fees. Will James's bronze applique do any better? and Catherine thought it was a risky lot. -And we love a gamble. Lot 45 is the Jon Richard Accessories applique there. -At £60 here. Five now. At £60 in front of me now. £60 bid. At £60 right in front of me now. -Come on, internet! Come on! -At £60. Are you all sure? At 65. 70. -At 75. Someone is bidding. Who is bidding? Still cheap at £80. Five now. At £80. Are you sure? How did you manage that? That was lucky, actually. -That could have been a blood bath. -That could have been a bomber. She must have thought it would lose more! But a whacking £66.79 comes off his profit. Catherine's travelling bottles are next, they cost her £50. -..gentlemen's bottles with silver tops. -100. He is asking for 100. -80? 50 to get on. £50. 50 bid. 60. At 60 in front of me now. £60. Five on the net. -They should be a lot more. -Come on, internet! Don't let me down. Come on, internet! -opportunity to make some money, wasn't it? Thank you, James, for making me feel worse! this time to the tune of £5.86. -At 35. Are you all done? Oh, that's less than he paid for it. And after fees, Bingo loses £23.93. It's not boding well. Actually, we're not doing too well so far. -We've made a loss on everything. -All be them quite small. -Small. Yeah, that's all right. We can draw comfort from that. to write home about either. Making her another £22.94 loss. which she bought for £45 in Belgium. I can start you here at £30. -I need a lot more. Come on. Five anywhere? All sure then? Are you all done? worse off than she arrived! but his portrait painting struggles to get much interest in the room. Oh, dear. That's a quarter of what he paid for it. And after fees, that takes £52.38 from his profit pot. It all rides on the polo player! The polo player has now go to make £300 for me to break even. No pressure then! He bought the painting for just under £29. The polo players. 30 then. -20. It's got to be £20, hasn't it? -£20 the polo players. £20 bid there. Five at the back. 25. 30 if you like, sir. At £30. Five if you'd like, madam. -That is just so cheap. Bingo takes a final loss of £16.63. And that brings the Showdown to a crashing end. That's really sad. I'm genuinely really sorry for you. -That deserved to do a lot better. -Let's go and cry together. with not a single penny of profit between them! But who's lost the least? While they lick their wounds, let's have a look at the books. than half his budget, at £495.40. made from today's challenge will go to charities of their choice. today's Put Your Money Where Your Mouth Is Champion. James, it's been quite an interesting week. -We have just got through it, haven't we? Culminating in that awful auction. We bought...the rest of the time, I think we got some good things. -I was happy with some of the things I bought. I bought a painting and made quite a good profit on that. That was nice. Garden gates. Did well with some garden gates. -Yeah... I'm not sure about this. -I think you'll probably have it. That is shameful! Both of us. Isn't it? Well, I'm very pleased it's black and not red! I must say! but it's Catherine who takes the trophy for the day. week of challenges, so who's made the most? -That was very close. Well done. -So near yet so far. -Well done to the winner. -It's been such fun, James. So Canny Southon does it again! and every last penny of that is going straight to good causes. a charity that enables disabled people to scuba dive. My chosen charity is Target Ovarian Cancer. so it's a charity that's very close to my heart. after a week of all-out profit war. and selling antiques when their own money is on the line. 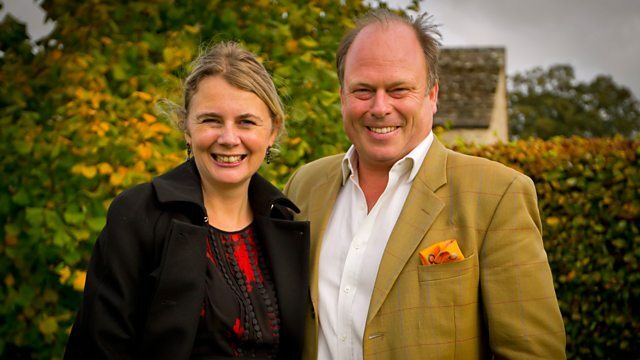 Antiques experts James Braxton and Catherine Southon face off for the big showdown. It's a rollercoaster ride of buying and selling, but what happens when the hammer falls at the final auction? Who will be the overall winner?